Anyway, I’m always excited to try a “copy cat” version of restaurant food. That’s one of my favorite things to do because let’s face it, I can’t afford to eat it out all the time. 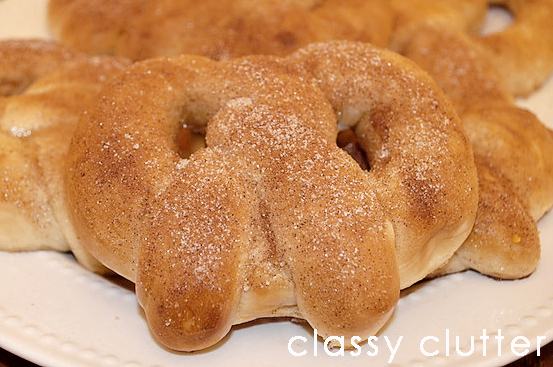 One of my major food weaknesses (and believe me there are a lot of them) is Auntie Anne’s Cinnamon Sugar pretzels! *Cue hallelujah choir singing* YUMMM!!!! If I pass the stand in the mall… forget about it! I’ll take a cinnamon sugar pretzel and a lemonade please! And…. $8 later…. BOOO!! I have browsed and browsed and I’ve found Auntie Anne’s copy cat! Today, I’m going to share that with you! Garlic Powder or whatever you want! I’ve even seen pizza pretzels! 3. And sugar and flour and mix well. 5. Cut into long “ropes”. 6. Shape into pretzel shape! I even found this Auntie Anne’s video to help you learn how the pros at Auntie Anne’s twist those perfect pretzel knots! This one seemed a bit advanced when I first started but then I got the hang of it! This video is more for beginners and worked wonderfully. 7. Combine dipping solution ingredients in a shallow dish and dip pretzel shaped dough into solution. 8. 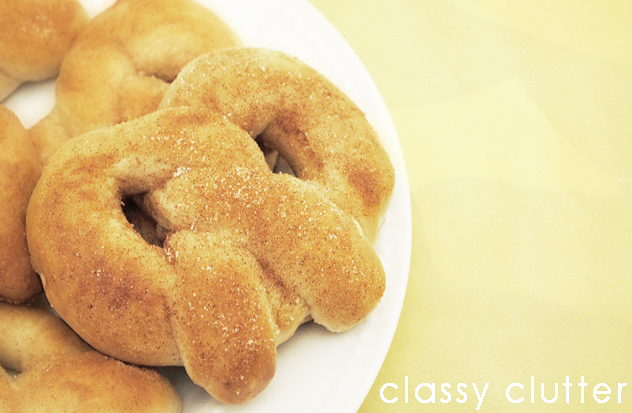 Place pretzel dough shapes on well greased cookies sheet. 9. Bake at 450°F for 7-8 minutes. Baking time may vary depending on your oven. 10. After baking, dip or brush on melted butter and add your favorite topping! I did cinnamon/sugar! Do you love Auntie Anne’s? and share it! Check out all of our Classy Cookin’ posts here. Sounds good to me. I have made pretzels to go with a big pot of stew. We had guests over for dinner that night and people couldn’t believe that the pretzels were home made. As if pretzels were some miracle treat that you only buy at the store. It never occurred to any of them to make their own. Thank you for this! I love Auntie Anne’s but it about kills me to pay $3 for the plainest one. Trying this one soon! ohhhhhh yum! these look amazing! I must try these asap! i am such a pretzel fan! About how many pretzels should this recipe make? I made these today and had to almost tripple the baking time so I am wondering if I just made them way to big (trying to make them the size of a pretzel that you buy in the mall). Once finished they tasted great!